(133:3.6) When in Rome, Ganid observed that Jesus refused to accompany them to the public baths. Several times afterward the young man sought to induce Jesus further to express himself in regard to the relations of the sexes. Though he would answer the lad's questions, he never seemed disposed to discuss these subjects at great length. One evening as they strolled about Corinth out near where the wall of the citadel ran down to the sea, they were accosted by two public women. Ganid had imbibed the idea, and rightly, that Jesus was a man of high ideals, and that he abhorred everything which partook of uncleanness or savored of evil; accordingly he spoke sharply to these women and rudely motioned them away. When Jesus saw this, he said to Ganid: "You mean well, but you should not presume thus to speak to the children of God, even though they chance to be his erring children. Who are we that we should sit in judgment on these women? Do you happen to know all of the circumstances which led them to resort to such methods of obtaining a livelihood? Stop here with me while we talk about these matters." The courtesans were astonished at what he said even more than was Ganid. As they stood there in the moonlight, Jesus went on to say: "There lives within every human mind a divine spirit, the gift of the Father in heaven. This good spirit ever strives to lead us to God, to help us to find God and to know God; but also within mortals there are many natural physical tendencies which the Creator put there to serve the well-being of the individual and the race. Now, oftentimes, men and women become confused in their efforts to understand themselves and to grapple with the manifold difficulties of making a living in a world so largely dominated by selfishness and sin. I perceive, Ganid, that neither of these women is willfully wicked. I can tell by their faces that they have experienced much sorrow; they have suffered much at the hands of an apparently cruel fate; they have not intentionally chosen this sort of life; they have, in discouragement bordering on despair, surrendered to the pressure of the hour and accepted this distasteful means of obtaining a livelihood as the best way out of a situation that to them appeared hopeless. Ganid, some people are really wicked at heart; they deliberately choose to do mean things, but, tell me, as you look into these now tear-stained faces, do you see anything bad or wicked?" And as Jesus paused for his reply, Ganid's voice choked up as he stammered out his answer: "No, Teacher, I do not. And I apologize for my rudeness to them — I crave their forgiveness." Then said Jesus: And I bespeak for them that they have forgiven you as I speak for my Father in heaven that he has forgiven them. Now all of you come with me to a friend's house where we will seek refreshment and plan for the new and better life ahead." Up to this time the amazed women had not uttered a word; they looked at each other and silently followed as the men led the way. Imagine the surprise of Justus' wife when, at this late hour, Jesus appeared with Ganid and these two strangers, saying: "You will forgive us for coming at this hour, but Ganid and I desire a bite to eat, and we would share it with these our new-found friends, who are also in need of nourishment; and besides all this, we come to you with the thought that you will be interested in counseling with us as to the best way to help these women get a new start in life. They can tell you their story, but I surmise they have had much trouble, and their very presence here in your house testifies how earnestly they crave to know good people, and how willingly they will embrace the opportunity to show all the world — and even the angels of heaven — what brave and noble women they can become." 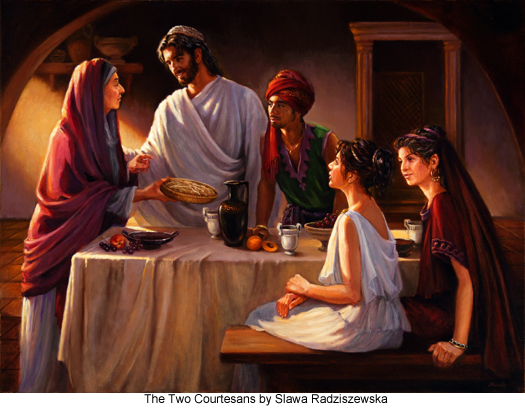 When Martha, Justus' wife, had spread the food on the table, Jesus, taking unexpected leave of them, said: "As it is getting late, and since the young man's father will be awaiting us, we pray to be excused while we leave you here together — three women — the beloved children of the Most High. And I will pray for your spiritual guidance while you make plans for a new and better life on earth and eternal life in the great beyond." Thus did Jesus and Ganid take leave of the women. So far the two courtesans had said nothing; likewise was Ganid speechless. And for a few moments so was Martha, but presently she rose to the occasion and did everything for these strangers that Jesus had hoped for. The elder of these two women died a short time thereafter, with bright hopes of eternal survival, and the younger woman worked at Justus' place of business and later became a lifelong member of the first Christian church in Corinth.